Home Blog Overhead Cranes Vs. Lift Trucks Part 2: How to Convince your Boss to Make the Switch! Overhead Cranes Vs. Lift Trucks Part 2: How to Convince your Boss to Make the Switch! My company is upgrading their facility, and we want to add new machines. I am the CNC department manager and it’s my job to arrange the machines. My boss wants to use forklifts to load and unload heavy parts. We run parts up to 400 pounds on a regular basis. Until now, we have used a forklift to move most of these loads. I worry every time I see the boom swing by the control panel. I thought the forklifts were a temporary solution, but my boss doesn’t want to change our current setup. I think using forklifts for this type of operation is dangerous and less effective in the long run. But, since that’s just my opinion, I don’t have any concrete information or even a professional opinion to present to my boss. We talk about switching to a forklift free application a lot. That’s not because we don’t like forklifts, but it’s because we want workers to use them safely and effectively. Using the right tool for the job will—inevitably—improve production and safety. For the application noted above, using a forklift is not the best material handling solution. There are multiple solutions, all of which would be more effective and safer than using a forklift, but for the sake of this scenario, we will highlight one great material handling option and outline its benefits. Arming yourself with the knowledge you need to sit down and discuss your concerns with your boss is perhaps the only way to convince him or her to make the switch! According to the Canadian Centre for Occupational Health and Safety, Improper assignment of forklifts and operators is one of the top five reasons that forklift accidents occur. “The first time a worker takes a fork to the head, it will probably be the last, “ explains Spanco Technical Sales Specialist, Rob Jimenez. That really demonstrates the importance of practicing safe operating and proper use—not just with forklifts, but also with any piece of large equipment. In the scenario above, the CNC manager knows that using a forklift is a cumbersome, unproductive method for moving heavy parts around a machining area. But most of all, he is constantly worried about product damage and the safety of his workers. As we’ve said before, forklifts serve a useful purpose for many industries and in a wide variety of working environments. But, not every application is best served by a forklift. In fact, some are just down right dangerous. OSHA advises that forklift operators and employers know their working environment and the constraints of their material handling solutions. That means, operating a medium to large size forklift in a small CNC machining area to reach into VMC’s and remove parts with an attachable boom is a disaster waiting to happen. At best, the boom could swing to one side, potentially damaging the control board or causing system failure, and at worst, the operator could tip or even pin another worker against a machine while trying to navigate through and around tight spaces. OSHA estimates forklifts cause about 85 fatal accidents per year; 34,900 accidents result in serious injury; and 61,800 are classified as non-serious. According to the Industrial Truck Association, there are about 855,900 forklifts in the U.S. Therefore; over 11 percent of all forklifts will be involved in some type of accident each year. The ITA also reports that the useful life of a lift truck is about eight years. This means that about 90 percent of all forklifts will be involved in some type of accident during their working life. If you operate this equipment, there is a possibility that you may have an accident at some point during your career. A staggering 42.5 percent of forklift accidents occur in the manufacturing sector. What’s more, 25 percent of those accidents occur when a worker is crushed between the forklift and another object or surface, and ten percent occur when the forklift strikes a worker. Sadly, most forklift accidents could have easily been prevented, oftentimes with better training, or by using a more appropriate form of material handling for the application. Forklifts lack fine control, and the boom swing is a potential safety issue for workers standing nearby and for the worker directing the forklift. The level of precision and maneuverability required to reach into these machines and move heavy parts cannot be achieved safely and effectively using forklifts. It’s simply not what they were designed to do. Forklift drivers need focus and clear visibility. If the forklift driver is moving the load, his or her vision can be greatly diminished. Navigating—especially through small spaces—causes a greater potential for disaster. If a driver moves six inches too far in any one direction, the result could be fatal. Because forklifts are a two-man operation, they require a lot of space to maneuver safely. A small machining area like the one described above is usually limited in space and consists of multiple obstacles, which could cause a potential catastrophe to equipment and staff. In this particular situation, the manager explains that the lathes and mills are fully enclosed. They are surrounded by sheet metal when the doors are closed, and the chuck is only accessible when the doors are open. The doors ride along a track above the chuck, and when they’re open, the operator can reach in with the boom attachment to pull out parts. The problem is, the forklift lacks the precision necessary to reach into the machine without bumping into the doors. Over time, the doors will sustain enough damage that they will need to be replaced. Using the correct material handling solution will provide the precision and accuracy needed to reach into the machines without damaging them in any way. In the long run, switching to an overhead crane will prevent the company from having to replace their machines due to consistent damage from forklifts. The bulky nature of forklifts requires large aisles or work areas, especially to turn. 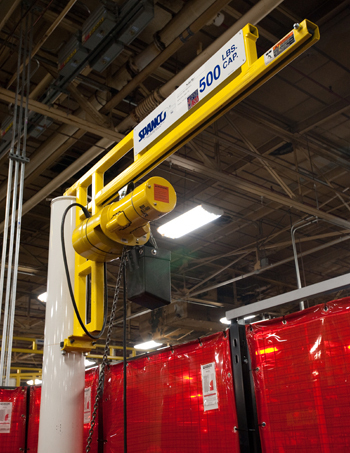 Using an effective wall-mounted or ceiling-mounted overhead crane only requires overhead space. Workers can move around below the crane, and easily reach up to control it when necessary. Aside from safety and space, the CNC manager highlights another problem with using forklifts for this application: wasted time and loss of production. According to him, workers often have to wait five to twenty minutes for a forklift to become available. It takes a lot of time to navigate in and around small machining areas, remove and transport parts, and load and unload the forklift. Some of the parts have to be loaded more than five times per shift, and the time lost is significant. Furthermore, using a forklift requires two workers, while an overhead crane only requires one to operate the hoist. Using one worker in each machining area to lift parts from each machining area cuts the cost of labor in half. But it would also require installing one small overhead crane for each station. With a crane overhead, workers can reach up and position the hoist whenever they need to lift, transport, and place parts in and out of a machinery. 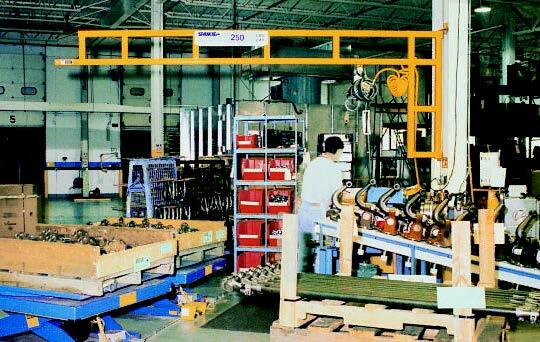 For this application, we vote for wall-mounted workstation jib cranes installed over each machining area. These ergonomic, low-cost jib cranes are a perfect solution for the lift and transfer of repetitive loads. They’re small enough to fit in tight spaces, and faster to operate than motorized jibs. Wall-mounted workstation jib cranes provide 200-degree rotation over each work area, and each system can be customized to cover a specific span. Pre-engineered wall-mounted workstation jib cranes span up to 16 feet, but a customized system can span as much as 20 feet to cover larger work areas. A tie-rod supported, trussed track workstation jib crane can even span as much as 34 feet, if necessary. Capacities range from 150 pounds to 1,000, but for most machining applications, lower capacity cranes are more than adequate. Workstation jib cranes are unique because of their enclosed track design, which creates a lighter system, making the jib much easier to rotate and position. Wall-mounted workstation jib cranes can be tie rod supported for the lowest cost or compression braced for additional headroom. This is especially useful for facilities with overhead obstructions or to supplement a larger overhead crane system that runs the entire length of a facility. 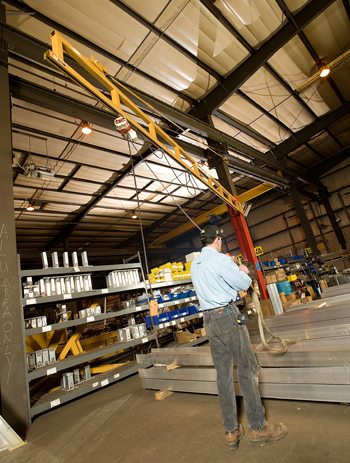 Overall, using overhead cranes in this application is a safer, more efficient method of material handling. Compared to forklifts, overheads cranes have a five to one safety factor, and operators are not in danger of tipping them over. Because overhead cranes are easier to access and faster to use, workers are more likely to use them to lift even smaller loads, which will greatly reduce the potential for workplace injuries. 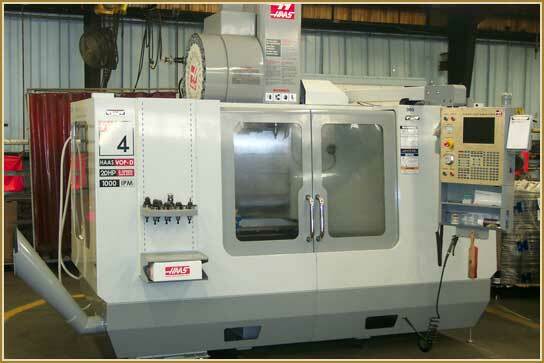 A wall-mounted workstation jib crane installed over each machining area would require an investment. But, the added of efficiency of cutting labor cost in half and utilizing worker time more effectively will quickly provide a return on that investment. Overhead cranes are not only safer and more cost effective; they also require less space (no floor space for wall-mounted jibs) and lower maintenance costs. Workstation jib cranes come in several other models, including a freestanding and portable base model. These are a great option for work areas requiring an individual material handling solution in facilities with overhead obstructions or without adequate structure support for wall-mounting. Making the decision to overhaul an outdated, ineffective, or poorly managed material handling system can seem like a daunting task, but making the switch will markedly improve safety, production, and efficiency, resulting in less down-time, cost associated with accidents, product damage, and maintenance. What are your thoughts? Would you recommend a workstation jib crane for this application? We welcome any feedback, questions, thoughts, and ideas!